Israeli soldiers and the navy shot and injured, Monday, 29 Palestinians during a nonviolent flotilla procession from Gaza city shore towards the shore in northern Gaza, close to the Zikim Israeli controlled shore. Medical sources said the soldiers injured 29 Palestinians, including 11 with live fire, after the army fired a barrage of live rounds and gas bombs at the protesters in the fishing boats, and on the shore. 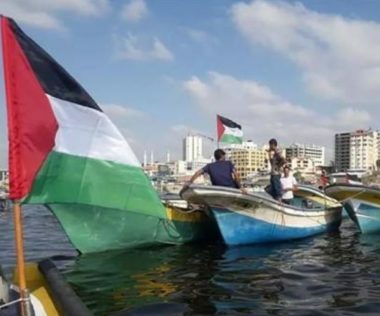 Media sources in Gaza said the Palestinians sailed in 32 small fishing boats, while hundreds gathered near the shore chanting for breaking the illegal Israeli siege, the Right of Return of the refugees and for liberation. Several nonviolent protesters managed to raise Palestinian flags near Zikim military base, while the soldiers fired a barrage of live fire at them, before they managed to escape.